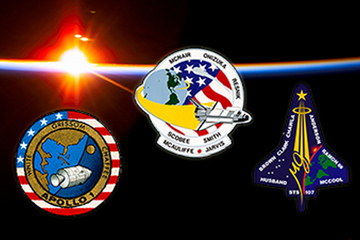 Patches from the Apollo 1, Challenger STS-51-L, and Columbia STS-107 missions (Credits: NASA). NASA commemorates its fallen each year in the week that saw the loss of three of its spacecraft. The Day of Remembrance this year will be observed on February 1, 2013, the tenth anniversary of the loss of Space Shuttle Columbia and the seven members of the STS-107 crew: Rick Husband, William McCool, Michael P. Anderson, David M. Brown, Kalpana Chawla, Laurel Clark, and Ilan Ramon. We’ve written much about that accident in recent weeks. There is no question that the astronauts lost in NASA’s three major accidents were daring and were willing to risk their all for the adventure of a lifetime. But their daring is not an excuse for sloppy safety practices; the interval between the loss of Challenger and the loss of Columbia shows how easy it is to slip back into schedule-pressured decisions and organizational disconnect. The shuttle is gone now, and to many Bolden’s “cusp” seems far off in the distance. Will the safety lessons of the Apollo 1 fire, the Challenger explosion, and the Columbia Disaster be retained in the interim? In light of history and human nature, it would seem an uphill battle. Ten years is not that long a time in the span of a life or of a career. The loss of Columbia is still fresh to many, and yet more space industry and agency personnel are hired every year to whom that loss is just a childhood memory. There are yet more for whom the Challenger loss is not even a memory, just history. Is an annual day of commemoration sufficient to maintain the safety culture and systems thinking that will prevent the next Apollo 1, the next Challenger, and the next Columbia from taking with it more of our piorneering spirits? Probably not. But maybe, just maybe, it is enough to remind us why we must spend the rest of the year beating the tattoo of space safety.